Special Containment Procedures: Due to frequent usage, SCP-1089 is to be kept in an 8x8 metal containment cell. The door to the cell is to remain electronically locked at all times and only the designated researchers are to be given the keypad code. No other personnel are to be given admittance without Level 3 Security Clearance. SCP-1089-p are several small 'pills' roughly 1.5mm in length. 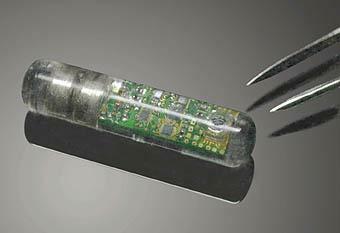 Pills are initially covered in a grey coat of gelatin - this coating can be carefully scraped off revealing what appears to be a complex microchip. Further examination has proven impossible as SCP-1089-p's interior components appear to dissipate instantly and harmlessly into the air when or is opened or pierced. SCP-1089 exhibits its anomalous properties when worn and activated. The goggles override the wearer's sense of sight, causing the wearer (henceforth referred to as the 'observer') to be able to see as though through the eyes of another specific person. This specific person becomes 'marked' by ingesting SCP-1089-p and this effect persists for an unknown and possibly permanent duration. The observer remains self-aware while watching a marked individual and SCP-1089 appears to block all sound - researchers have reported being unable to hear anything while observing. There appear to be several 'channels' depending on the setting of the radial knob and each active channel has its own marked individual. 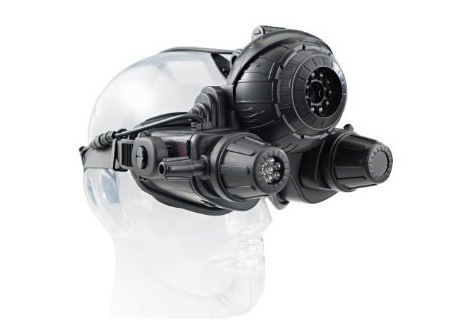 SCP-1089-p seem to be linked to the channel the goggles are set to. When set to any channel except '4' the compartment is completely empty. Subject D-1089-1 was given a pill from '4' and upon ingestion the compartment was suddenly empty. Immediate termination of D-1089-1 shows that the link expires when the marked individual does and compartment '4' once again contained SCP-1089-p.
2) SCP-1089-2 is an individual of unknown gender in a padded cell in an unknown location. It is suspected that SCP-1089-2 may be forcibly restrained as little to no movement has been observed. Every day at precisely 0800, 1300 and 1800 a woman of medium age and build wearing a plain grey dress and glasses enters the room with what appears to be a bowl of food-paste. The woman spends 5-10 minutes feeding SCP-1089-2 and promptly leaves with the empty bowl. She has never been observed to smile or attempt to converse with SCP-1089-2 during these feeding times. Every time as has been observed has been the same food-paste and the same plain grey dress. Foundation agents have been investigating the identity of the woman but thus far she remains unknown to Foundation personnel. Observation to continue as scheduled. 3) Based upon information gathered from observation, investigation into the identity of SCP-1089-3 has been successful. SCP-1089-3 is the estranged father of U████ P████████. It is not known why U████ P████████ was watching his father, nor is it deemed scientifically relevant. Investigation discontinued and observing SCP-1089-3 has been deemed largely a waste of time. 4) Channel 4 has been cleared for testing on D-level personnel and due to having complete control over SCP-1089-4 this is to be the primary channel of observation (No further testing is to be allowed without O5 approval). D-1089-1 as SCP-1089-4 was briefly observed before termination. D-1089-2, surgically blinded, was observed next. Observation of SCP-1089-4/2 was reported to be blank in a manner consistent with Channel 1. D-1089-2 was then scheduled for immediate termination so that the channel could be freed up for more useful research. D-1089-3 ingested SCP-1089-p and was placed into solitary confinement for a period of 48 hours. As it seems there are no adverse effects to SCP-1089-p other than linking the target for observation, SCP-1089/3 was reassigned to SCP-████ so that observation would yield more data than "still in solitary confinement" - SCP-1089-2 does that already. That this item is of 'Factory' manufacturing and channel 5 changed without action from us suggests there are more goggles and channels are shared among them.